We wanted to send a quick update on Moose. We adopted him more than a year ago and he’s been great! Moose loves laying in the sunshine, taking long walks around the neighborhood, going for car rides, playing with his toys, and snuggling on the couch. We have moved away from Texas, but Moose has adjusted well to his new home in Florida. 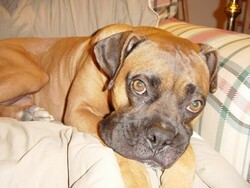 In a few weeks we are planning on getting a female boxer from our local rescue here so Moose has a sister to play with! Thank you so much for your help in finding us our perfect dog and for helping Moose find his forever home!